The Cortex System exploded onto the scene with the best-selling and award winning Serenity Role Playing Game, and is also the game system used for the Battlestar Galactica Role Playing Game, Supernatural Role Playing Game, Demon Hunters, and more. For years the fans have been asking if there would be a core rules set to allow gamers to easily make use of the game system for whatever genre, setting, or story they chose. 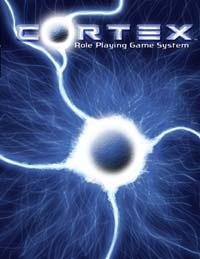 The Cortex System Role Playing Game is the answer. Featuring an easy-to-learn, fast-playing engine that focuses more on stories and characters rather than numbers and rules, the Cortex System RPG offers option for playing everything from high fantasy to gritty science-fiction to fathomless horror without having to learn a new set of rules. I read very favorable reviews so far. Okay borrowed a copy of the Cortex System and just started reading it. Looks REAL interesting and potentially a LOT of fun. Is this system open to 3PP or is it closed and only Margaret Weiss Productions can use it? i have played some games that use the Cortex system like Serenity etc. It is a fairly simple quick system. It is along the same lines as the White Wolf Storyteller system on how it plays, but I think more flexible and likely better balanced than the Storyteller system. For a simple/rules light system it is by far my favorite if that's what I am wanting. I don't actually have this one though, so not sure how much if anything is different from the version they have in their games. my guess is minor tweaks to highlight what those games are about. Looks REAL interesting and potentially a LOT of fun. Is this system open to 3PP or is it closed and only Margaret Weiss Productions can use it? I didn't see any mention of a 3rd-party licence. MWP have a good range of settings though. As well as their SF licences, the Castlemourn Cortex Quickstart is well worth a read. I have the SC version of this. I played in a straight up CORTEX only game for several months and we had enough fun we are making noise about going back to it when we wrap up Eclipse Phase. So I would say it is good. So what is your opinion on its combat system? It runs pretty simply, seemed a little deadlier than most. Definitely had us on the edge of our seats when we got into fights. After a few weeks we even felt comfortable designing gear beyond what is in the book. Cool.Does it have specific location hits? It has Called Shots. With modifiers based on where you want to hit, such as torso versus an arm. But you do not hit in a "specific" location by default. It is abstract unless you make a Called Shot. What was the genre/type of your Cortex campaign if you don't mind asking? Sci Fi. The GM liberally stole ideas from popular TV shows and movies, such as Serenity, Babylon 5, and Stargate. We looked at using it for fantasy, but decided we liked what we already use for that genre better. It does contain the basics for every genre. My favorite part is actually the skill and attribute dice, and how they combine to determine how good you are at accomplishing things. Neat idea, and not the first time I have seen it. Savage Worlds is very similar, I just like how CORTEX does it better. From what I hear so far it does seem to do well with SciFi. Have you played Atomic Highway? No, never even read it. @stroVal - Have you ever played Deadlands or Savage Worlds? Cortex or at least in Serenity and some of their other games I have is similar. It is not the same, but stats are d4, d6, d8, d10, d12 is how stats are done. Personally I think it would be do pretty much any genre well. Just as long as rules light worked for what you was trying to do.